Pearls Before Pumpkins | Comics I Don't Understand - This site is now being updated daily at http://www.comicsidontunderstand.com. Please change your bookmark if necessary, and notify any web site with a link to the old address. Depending on your feelings about PBS, it’s either an homage to or a blatant rip-off of Peanuts. Personally, it made me smile – even if I did roll my eyes a bit. Every year on the Peanuts Halloween special, Linus waits in a pumpkin patch for the arrival of the mysterious “Great Pumpkin,” always in vain. Often, another Peanuts character is duped into waiting with Linus, and they are always disappointed. This year, Rat and Pig are waiting with Linus. Bill, I know you didn’t see the Matrix or 300, but I’m stunned if you’ve never seen the Peanuts Halloween special. One of the things I love about Pearls is the combination of innocence and cynicism. Usually it is Pig who represents innocence in the world and , as in this particular strip Rat who is the cynic. In this case Linus takes Pig’s place as the wide eyed innocent. A nice tribute to Charles Shultz, now if you will excuse me, I have a very sincere pumpkin patch to go sit in. 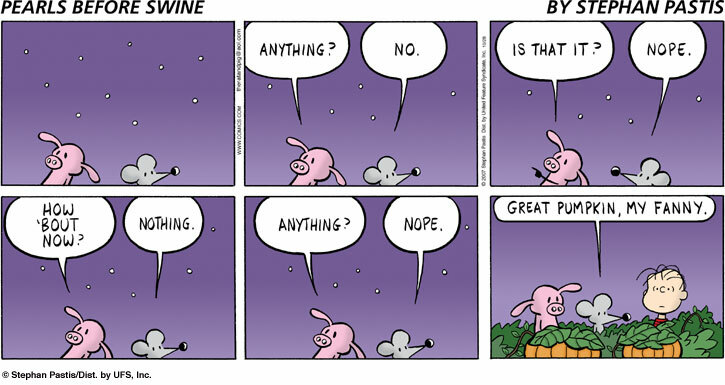 Today’s PBS strip is a drop-dead LOL one-check it out. Autumn, somebody sent me the comic as a CIDU and rather than see the obvious explanation, I went completely brain-dead and posted it as same. And Bill, I thought you were just being festive and giving a shout-out of sorts to our dear, departed Charles Schulz.